A change of sequence - different to what is currently shown in the drawing set. Screw Support Bushes M120220T to the spider with temporary screws and nuts at the back. And then there was a really wild spider . . . plus a friend with a milling machine who owed me a favour . . . .
After welding the 6 support bases to the spider plate, laid the spider down on those bases. Only 3 were touching, shimmed the the rest to get the spider to lie firmly on the milling machine bed. Then skimmed the top edges of the feet (yellow arrows) for a reference, plus removed the major lumps off the side of the feet (red arrows). This procedure is an overkill if one is only using 4 rollers, but the 6 roller version needs a precise alignment for the time when the slide enters and leaves the last set od rollers. That is, if your router is cutting at that time and you don't want to leave a mark in the work. It is more likely that one will not be cutting at that time, and that one is simply pulling the cutter up above the work. Are those two blocks welded to the back for a air drill? That's for the dust foot and hose mounting. Not tried yet, but I thought to weld it on just in case I needed it later. Our current dust foot "carrier" mounts off-center, to one side of the y-car, but that one hits the main table beams before the full y-travel is reached. This is what I have been doing yesterday. I am not really happy with it as the spider seams to flex under the hand pressure on the back of the spider. (but I only have a refference granite kitchen bench that I can use when SHE is out!). I am not sure how accurate to make this or if I am being too picky so I look forward to hearing the answers as well. That method has been used by others. RobertM in Quebec used his jointer cast outfeed table as a reference surface if I remember right. Polished ceramic floor tiles make good reference surface too. If you clamp the spider flat before welding and let it cool while clamped is this likely to reduce the heat induced distortion? It may help having it clammped, but I do not think that will completely stop it. Sanding all six bushes on a flat saw bench top will also take out any machining dsicrepencies. To be honest it does not take that long to sand them all flat and at least you know the spider plate will sit true in the V wheels. 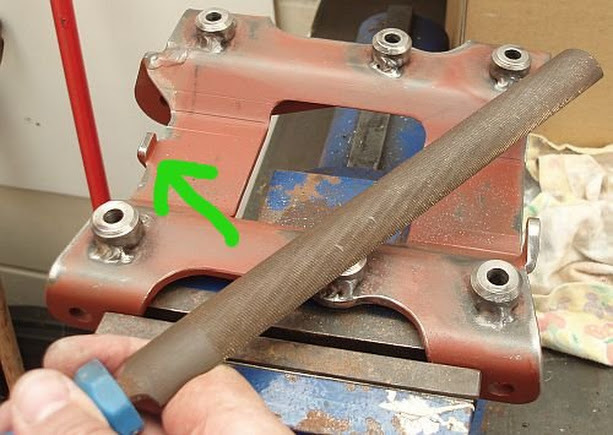 A smart whack with a hammer after welding is the quickest way to remove most of the distortion, caused when welding the middle roller bases. I think we already mentioned how to take out twist? Having something clamped across while welding will get in the way and won't eliminate all distortion because there will be "spring back" if there is a distortion problem. Realise that the spider plate gets most of its stiffness after it is intalled in the y-car - there is a bolt/nut adjacent to each of the four outer rollers. I read the crowbar technique and plan to sand things on a flat base, but I was hoping to minimise the twist to start with. Can you tell me what is this pin ? Can I reduce it of 2mm with my grinder ? That tab is designed to his the z-slide stop bolts. I am just going through this myself.